It is the Year of the Pig so one plant deserves recognition, the edible Australian native pigface. We visited Cool Country Natives at Pialligo to check out the horticultural temptations. They stock “White Hot” pigface (Carpobrotus rossii) from the “Gardening with Angus” range, that is Angus Stewart formerly of “Gardening Australia”, which describes the foliage as having a salty custard taste. Members on the staff at Cool Country Natives who have eaten the succulent foliage and fruit describe it as having a distinct, slightly salty green taste, all the way to the back of your palate. Eaten raw, they said it leaves a chalky residue. We can grow “White Hot’ pigface in Canberra but our frosts do burn the foliage so it is best in a slightly protected position. They also sell a pigface cross (Disphyma crassifolia) “Pink Passion” which has smaller finer succulent foliage. Both types of pigface are excellent options for pots in full sun as they spread and fall over the sides which is quite structural and dramatic in taller pots. Owner of Cool Country Natives, Megan Brien, lives in Binalong and said she was a civil engineer building roads who “stepped sideways into landscaping”. The business has grown in just over three years from three tables of plants to a large and popular array of species. Tube stock are raised on site in a team led by Tegan Redman who is described as a “whiz” with plants. Among the edible Australian natives are kangaroo apple, mountain pepper, Warrigal greens, native raspberries and salt bush (Atriplex nummularia). Bronwyn Blake, a member of staff who lives in Gundaroo, says, “we all grow what we sell – mostly because we can’t resist the temptation! 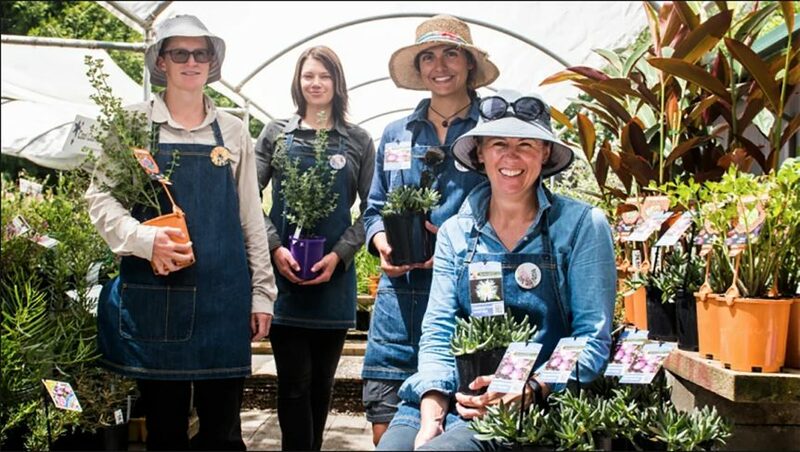 – so we advise customers using our horticultural training and experience with gardening in our challenging climate.” She said native edibles is a very trendy topic at the moment and they can’t keep up with the demand in spring and autumn when everyone is busy in their veggie patches. Lots of schools are also growing Australian native edible gardens, the trick there being to keep them watered and fertilised during school holidays. They strongly advise people to do their own research and seek medical advice for particular conditions/allergies before eating any plants. The staff took a vote and agreed that Mentha australis, commonly known as river mint, was an easy go to favourite. It is a low growing perennial with edible scented foliage which has a fresh minty flavour. Most of the staff grow it in a pot or garden bed near the back door as it needs regular watering to be at its best. One of Canberra’s longest established edible native plantings is in the Australian National Botanic Gardens on Black Mountain. There is an Aboriginal Plant Use Trail with a brochure sponsored by the Friends Public Fund which is available from the desk in the main visitor centre which visitors can use to do a self-guided walk. It comes with a request: please do not pick or eat the plants. It highlights a selection of plants and some of the ways that these were used by Aboriginal people in different parts of Australia including plants of culinary value. Several of the ANBG volunteer guides have been involved in leading bush tucker walks and Linda Beveridge has found that among the most popular plants are lemon myrtle (Backhousia citriodora), finger lime (Citrus australasica), native raspberry, quandong and lilly pilly. The Botanic Gardens’ site being on the slope of Black Mountain means frost slides down the hill and trees like lemon myrtle and macadamia can thrive, though they may not do so in a home garden. Linda says, quandong fruit (Santalum sp) is used as a soft centre in Haigh’s dark chocolates. Temptation indeed.